Waiting for the stock to simmer so I can add the noodles. See my purty blue Dutch oven. My old roommate Rhonda taught me how to love Chicken and Noodles and Mashed Potatoes, so I should probably call this Rhonda noodle soup, but instead at our house, we call it grandma noodles, after the premade frozen noodles that is a key ingredient. 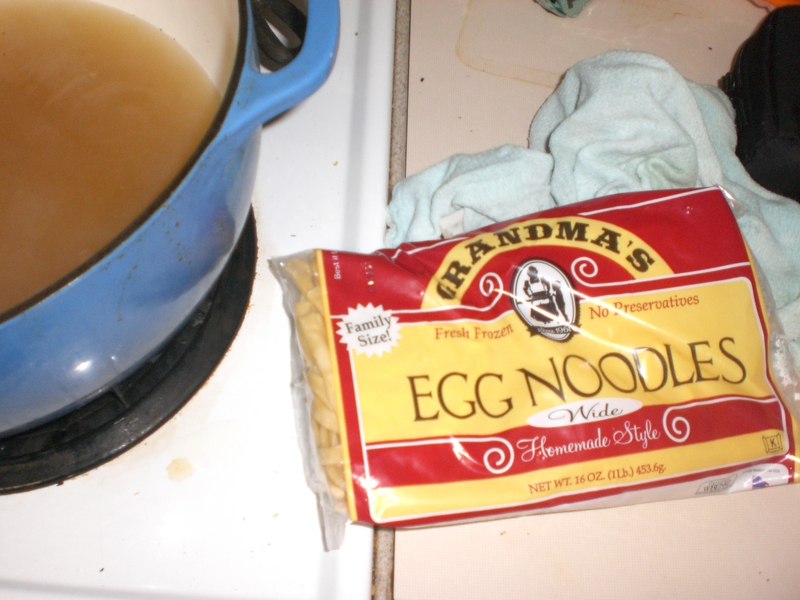 It could be made with dried egg noodles, but it wouldn’t be the same- check the frozen pasta section of your local mega mart, it is worth the search. At it’s simplest, this is noodles cooked in broth, perhaps with chunks of actual chicken in it and carrots, if you like mushy carrots, then served over mashed potatoes. It is insane, I know, to pour a starch based food over another starch based food. It’s crazy. Crazy delicious. 1 cup precooked chicken or turkey- leftover is great- in fact, this is a great post-Thanksgiving recipe, because you can do turkey stock. I have made this with store bought broth- Better than Bouillon is my favorite mix, but you can use whatever broth you like. I use homemade, lately, because I’ve learned how to make it. Look for it in a future blog post. Yes, it is a very beige meal, but sometimes you want beige. More color next week, promise. So, when the stock or broth is boiling, add the noodles and carrots and chicken, then simmer until the noodles are done. If you do it right, the soup will be done at about the same time as the potatoes. Drain the potatoes and return to the pan. Throw in some buttermilk and butter- I never measure, just a glug of one and a chunk of the other. Then mash. I like lumps. I grew up on instant potatoes, and appreciate the lumpiness of real ones. 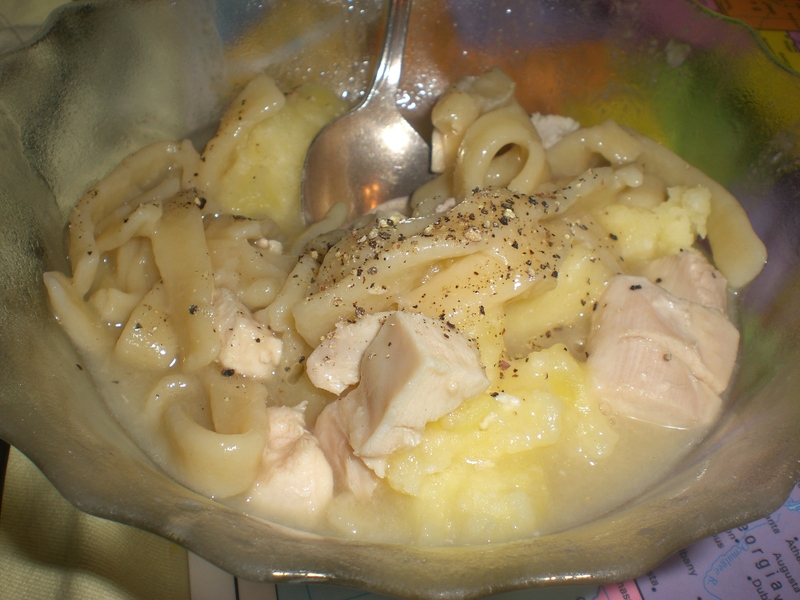 Dish up a serving of potatoes into a bowl and make a well in the middle, then scoop up some noodles and broth to cover. I made this as a back to school meal, but it works on a busy day, before trick or treating, after Thanksgiving, home from skiing, before basketball practice…anytime, I guess, that you want some starch with your starch. Be sure to have starch for desert, as well.